Email Etiquette is designed to help you understand how to write emails with proficiency. This course works for both personal and professional objectives. It gives you detailed information about various terminologies used in emails and different types of emails. This course gives you an insight on email structuring and ways of formatting emails. The course also provides tips to remember while using emails in formal communications. 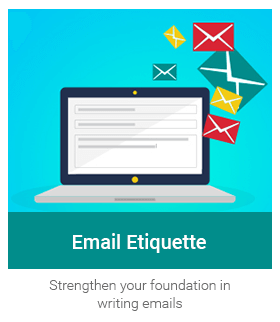 The Email Etiquette course strengthens your foundation in writing emails in just 5 exciting levels. Introduces email etiquette to the learner and explains its importance. It highlights consequences of not following proper etiquette. The learner is introduced to the difference between formal and informal emails and its usage. This chapter also gives an idea about the difference between writing an email and writing a letter on paper. Makes the learner familiar with the various terminologies in an email, for example, 'To', 'Cc', 'Bcc', 'Fwd' etc. The learner is taught when and how to use 'Reply' and 'Reply All'. The chapter covers the general rules of writing a subject line. It also talks about what is an email signature and why it is important. Learner is introduced to sample subject lines, dos and don’ts of salutations and also includes sample opening and closing phrases. This chapter gives a demonstration on how to create email signatures. Focuses of using the standard formatting (font, colour, size etc). Discusses the effects of mistakes in grammar & punctuation. The learner is familiarized with phrases and words to be used in different contexts of writing (For example, how to respond to a rude mail). The exceptions in spell check are highlighted, for example - homophones. Importance of adequate spacing in the body of the email to make it look clear and organised. Helps the learner to understand additional information on emails. It covers maintaining mailbox, examples of cases when legal action can be taken due to mishandling of confidential information and also common mistakes made with regard to language and formatting during writing emails.